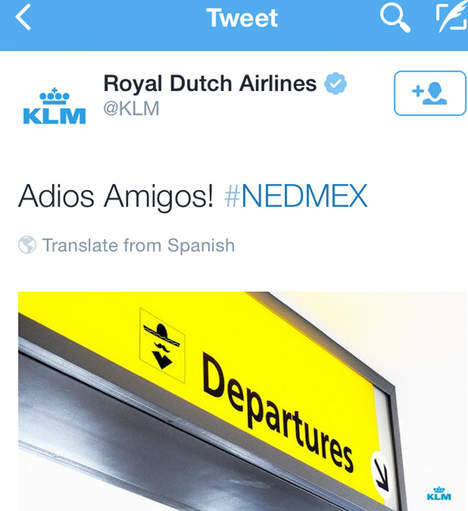 Why there’s nothing wrong with “adios amigos” tweet by KLM. There’s a big debate going on amongst marketers about the stupidity of a tweet by KLM during the world cup. I have a different view. It wasn’t stupid. It was on-brand. I don’t get it. We’ve talked for about a decade now about the humanization of brands. We all shout out that there’s no B2C or B2B any longer but everything is H2H, human-to-human, peer-to-peer. This consequently means brands and organizations start to act more and more as human beings, as people. Sure, you notice loads of faces on websites and other communication to show “the humanization of brands” but that’s merely “spielerei” and old school marketing trickery. The humanization of brands comes down to showing a personality. Who are you? What do you stand for? How do you act? When one looks at KLM, they clearly are Dutch. It’s a genuine part of their DNA. And Dutch stands for innovation, entrepreneurship and being self-confident maybe slightly arrogant but bold and courageous without a doubt. What you say? That’s right. Personality and identity of brands has less and less to do with logos, colours, fonts and other design elements. Just think about your social life. Do you really like everybody as much? How do you feel about politically correct people? Right, they are boring. They don’t inspire. But nobody really hates them. On the other hand, people with a vision and specific personality and identity are loved by some, hated by others. Why the KLM tweet wasn’t stupid? I truly believe the KLM tweet was beneficial. Apart from some Mexicans nobody was truly offended. On the other hand, it generated tons of Brand Mentions everywhere. If you didn’t know KLM before, you’ll probably do now. And do you truly believe Mexican people will not fly KLM anymore? They’ll probably do anyway. Because of the price, because of the service, because of social seat selection, etc. So brands, it’s up to you: boring and indifference by all? Or a human personality who’s hated by some, loved by others? One Response to Why there’s nothing wrong with “adios amigos” tweet by KLM.